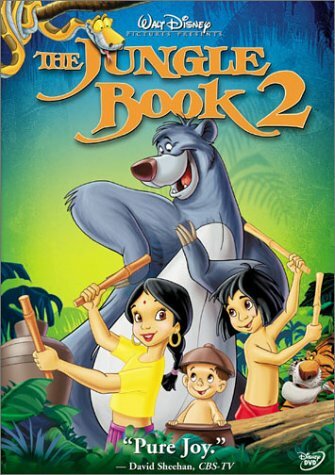 Disney's "Man Cub" Mowgli (voice of Haley Joel Osment) is back in this animated sequel to the 1967 classic. Mowgli, now living with an adopted family in a nearby jungle village, is homesick for his jungle adventures and his good friends, like Baloo the Bear (voice of John Goodman) and Bagheera the Panther (voice of Bob Joles). But because the villagers believe that the jungle is a dangerous place for children, Mowgli isn't allowed to visit. Bored and lonely, he dreams of his carefree days in the jungle and finally runs away from his new home to visit the jungle and the friends he left behind. This time he is followed by his neighbor Shanti (voice of Mae Whitman) and together they meet Baloo and friends for more adventures. The fun-loving, jovial bear is overjoyed to see his old friend, and a little jealous of Shanti, but together they share some spirited JUNGLE BOOK moments, to the tune of original classics like "Bare Necessities" and "I Wanna Be Like You" and new hits like "W.I.L.D." Mowgli is thrilled that things in the jungle haven't changed, until he realizes that Shere Khan (voice of Tony Jay) the Tiger is thirsty for revenge and threatening to harm his jungle family. Together with Shanti, Baloo, Bagheera, and some new faces like Lucky the Vulture (Phil Collins) Mowgli must fight Shere Khan one last time.